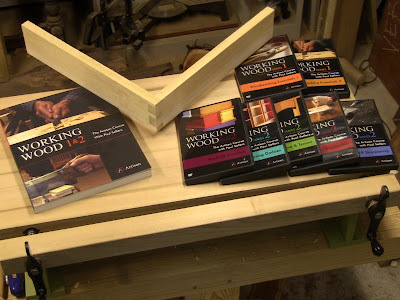 Paul Sellers' Working Wood book and DVDs, and one of my practice dovetails using his method. Paul Sellers has released an excellent and thoroughly enjoyable DVD and book set on hand tool woodworking. I first found out about Paul when his blog posts starting appearing on Luke Townsley's excellent aggregator site UnpluggedShop.com. I quickly realized he and I are on the same wavelength. Paul has been a woodworker for over 45 years, apprenticing at the age of 15 in the UK. He's been published in Woodwork, Fine Woodworking, and Popular Woodworking Magazine, and now runs the New Legacy School of Woodworking in North Wales, UK. The school is in Penrhyn Castle, which is maintained by the National Trust. I think he wins the award for most amazing workshop venue! In one of those minor coincidences of life, I was living in North Wales, PA, when I took my first woodshop class in 8th grade (from the first of three shop teachers missing a fingertip; jointer accident). That was a couple years after Paul had completed his apprenticeship. So for most of the time that he's been a woodworker, I've been wishing I was a woodworker. Paul is currently in the process of launching a US New Legacy School of Woodworking in upstate New York, scheduled to open in the Spring. You can read about it here. You can also see him this winter at several of the Woodworking Shows. He'll have a New Legacy booth at the Baltimore, Springfield, Somerset, and Fredericksburg shows. I'm hoping to meet him in Springfield. Closeup of my practice joint, the best I've ever done (ok, so this was my sixth attempt!). That black speck along the middle pin? Always be sure to THOROUGHLY wipe the honing oil off your chisel before returning it to the wood. After watching the videos and reading through his blog, I saw that he offers the newly published Working Wood 1 and 2 DVDs and companion book. I promptly ordered the full set. There are 7 DVDs total. They're available individually or as a set from Amazon , Lee Valley (US), Classic Handtools (UK), or directly from Artisan Media (full disclosure: I earn a small commission on sales through Amazon and Highland Woodworking links via their affiliate programs, though not through other links). The production style of the transitions and interstitial elements borrows from video gaming and Who Wants to Be A Millionaire, which some people may find distracting, but it keeps things dynamic. The workshop segments are filmed well, with good pacing. And that castle! The book is gorgeous, suitable for the coffee table (at least in a woodworker's home). It's best treated as a companion volume rather than a standalone text. In addition to background information, it has matching chapters for each of the DVDs. The whole package works best by seeing and hearing Paul work, then referring to the book when following along in the workshop. Paul's educational philosophy is a bit different from mine. After briefly introducing methods, he likes to use projects to develop the skills. I like to focus on skills separately, removing the fear of mistakes ruining a project. But that's why there's chocolate and that's why there's vanilla. There will be those who prefer to learn by one method and those who prefer another. The methods he presents are a mix of elements I've seen before and some new things. If you're a beginner who's never used hand tools, this would be an excellent series to use as your primary reference. If you're an experienced hand tool woodworker, it adds versatility and reinforces things from a new perspective. Just remember that you're seeing a practiced hand here, so don't be upset if you don't immediately get the same results he does. 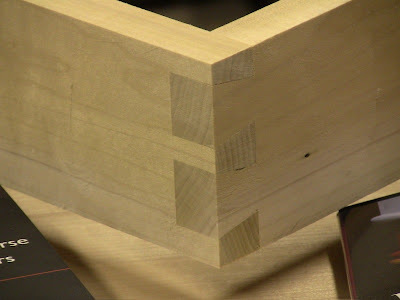 As always, good dovetails require accurate sawing to a line. The reason it took me 6 tries to get the joint pictured above is that I was homing in on that with each one. How do you develop a practiced hand? The same way you get to Carnegie Hall: practice, practice, practice, like this! I like learning from a variety of instructors, because each one will have a favored set of tools and techniques which he emphasizes, and those he glosses over. Comparing and contrasting different instructors fills in the whole picture to give me the broadest range of skills. In this case, Paul starts with lumber that's been dimensioned and squared up with machines (of course, you can do it with hand tools as well if you don't have access to machines). He introduces a minimal set of tools necessary to produce fine joinery, emphasizing three concepts: accuracy, sharpness, and technique. He present three fundamental joints, then use those to build a series of projects. He presents a number of fine details in the process. Throughout, he emphasizes listening to the sound the tool makes, as well as the feel of the wood. These sensory aspects not only make the work more satisfying, they are critical to achieving the best results. In Series 1, the first DVD is actually somewhat more organic than the rest. While the main focus of the overall series is on joinery, this starts with shaping wood to get an understanding of grain and how the tools interact with it. He uses chisel, gouge, spokeshave, and axe to quickly shape a spatula, a spoon, a bowl, and a three-legged stool. These are great introductory projects, quite a treat to watch. If they don't have you itching to put tools to wood, nothing will. They remind me of the work of Robin Wood, Drew Langsner, and Peter Follansbee. The second DVD introduces the tool set and techniques for accuracy. Paul goes through making a housing dado, a single-tail through dovetail, and a mortise and tenon (with multiple ways of forming the tenon). Series 2 expands upon the information from Series 1 and applies it to several projects. Simple in design, they do an excellent job of focusing on a particular joint. First is a dovetailed box in the Shaker style. Second is a four-shelf wall unit in the Arts and Crafts style, using interlocked housed dadoes and through mortise and tenon. Third is a small side table, using haunched mortise and tenons. From here you can use these techniques to build anything. The last project is a very nice English workbench. Paul addresses the logistical problem of trying to build a workbench without a workbench. The bench uses a classic Record-style quick-release vise. While Record is no longer in business, Anant versions of the vise are available from Highland Woodworking and Tools For Working Wood. The final DVD covers sharpening of a variety of tools. Interestingly, Paul uses a convex bevel method similar to Jacob Butler's, which I wrote about in the Grimsdale Method. Jacob encountered quite a bit of negative reaction when he discussed it on woodworking forums, yet here we see another professional who has used it to great effect for decades. The DVD is organized differently from the rest, as a series of short reference videos by tool rather than a linear presentation. If you enjoy reading this blog, you'll enjoy this set. Paul is currently at work on Working Wood 3. Thanks for the review Steve. I've been following Paul's postings and I've been thinking of buying the book/dvd course too. Reading your review made up my mind to buy it. Thanks for the shout-out about UnpluggedShop.com. You pretty much just wrote the review I would have liked to have written. I really like what Paul Sellers is doing and the stuff I have seen is really good. I'm planning to follow his projects in the course and teach my 8,7,and maybe my 5 year old some things. Of course, I've picked up some techniques and ideas too, but it is so down to earth, it is the only instructional like it I have seen that is a reasonable possibility for properly supervised kids. I get a 404 - not found error using the Amazon link. I took a week long class with Paul Sellers in Waco, TX. He's an amazing woodworker and from what I've seen so far hasn't changed his presentation style or beliefs. Years later I'm still absorbing what I learned there though to be fair I've barely had time to put in the practice. It's a bit different from many things I've seen since but it's eminently practical and watching him work you can't deny his methods are sound. I've often gotten the feeling he takes shortcuts that he doesn't teach, such as the pre-dimensioned lumber which drives me a bit batty as that's a critical first step. Still, I think I'll be ordering his set as money permits. I'm glad you guys enjoyed the review, I do think it was money well-spent. I've corrected the Amazon link, thanks for the heads-up! I too have wondered about this course. I want to start woodworking using hand tools only. However, after reading your review, I’m concerned about some things. 1) If building a workbench does not appear until just before the end of the course, then how does Paul explain securing wood to use planes, chisels and saws prior to that? 2) With wood costs in mind, I would want to learn how to mill un-milled lumber (even though I may not always purchase rough cut lumber), but it doesn’t sound like Paul addresses this. This would leave a very important skill set un-attended. One that I would have to invest in some other resource to teach me. 3) Sharpening is something I would want to learn before I even began using hand tools (primarily plane irons and chisels), yet it’s not covered until the end of the course, and that’s after building a work bench, assuming one were to even use Paul’s workbench plans. I’m not sure this course is right for me. What am I missing? Yes, I think these are questions a lot of people have. First, I'd just reiterate that it's worth studying multiple different resources, because each instructor has his own things he wants to focus on, along with his own preferences for tools and methods. Even when one does cover an area you're interested in, you may not get the coverage you want, and at some point the time constraints of the medium force the instructor to make some hard choices. For milling lumber, I would recommend either Chris Schwarz's "Handplane Basics" DVD or Jim Kingshott's "Bench Planes" DVD. Both are excellent, and dovetail nicely with Paul's course. Even there, you still have their preferences for tools and methods, and neither DVD covers the full set of tasks to go from raw lumber to dimensioned pieces (neither one addresses sawing). That's one reason why I cover both individual skills and overall stock preparation in my instruction (I'll get it posted eventually!). Paul's course is flexible enough that you don't have to wait until the end to look at the workbench or sharpening DVDs. You can start right off with either one. Actually, I prefer to start people off with sharpening, because you can't get any work done if your tools aren't sharp, but many viewers will say, "Yeah, yeah, let's skip to the good stuff, I want to make something!" So Paul satisfies that urge, and refers you several times to the sharpening DVD if you need it. You can watch the DVDs in any order without too much confusion. You could easily start out just watching the first 2 DVDs without doing anything in the shop, just to get familiar with his methods, then go to the bench DVD and build a bench. He uses a portable Workmate and kitchen table while building his. But the rest of the course does assume you have a decent bench to work with. Thank you for the excellent reply Steve. I guess I’m being unrealistic looking for a “one course covers it all”. And thank you for the good advice on the other resources and also how to approach Paul’s course. Something I’ll want to look into. I see I didn’t add my name to the previous post. A problem when posting anonymously. Very nice review and a nice blog to follow. I'm going to be at the Baltimore show and plan to spend most of the time handing around Paul's booth watching and learning. I'm going to pick up the dvd/book at the show and get it signed while I'm at it. I picked up the book and DVDs at the Baltimore show. Really enjoy them and have begun using them to teach some things to my kids as well. One of the aspects of handtool work that really appeals to me that Paul talks about a lot is re-engaging children in the shop. That said, I'm also eagerly awaiting the posting of more of your course, Steve. I bought the whole set through Amazon after seeing Paul at the woodworking show in Springfield. I attended the show not knowing anything about Paul or hand tool woodworking. I have been without a work space for nearly 16 years and now have a shop that was built in November 2011. There is no power and no heat yet. The first thing I bought was an old Shopsmith like the one I used to have and a Reliant 2HP dust collector. After watching the videos and reading the book I won't be filling the workspace with power tools. I'm thinking of selling the Reliant and maybe the Shopsmith as well. The workbench will be my first project. The fact that I can build it with grade A construction lumber makes it a lot easier for a beginner like me to get started. The videos can be followed in what ever order you want. PowerCurve1800Love? Blogger won't let me sign in with another account. The Toro Power Curve 1800 is the best little snow thrower going. One must always treat one's snow thrower with love and affection! What size and sweep does Paul use for the beginning projects? I have seen tons of clips online and have the free DVD, but I don't know enough about gouges to figure it out. This set is definitely going on my wishlist. P.S. Sorry if I posted more than once, my security plugins on Chrome were kinda messing things up. He's using a pretty hefty out-cannel gouge, 3/4" or 1". In the Pfeil line, a similar one might be a 18-25mm #8 or #9 sweep. I'm having a problem translating the UK lumber dimensions of the bench into what we have here in the US. I don't want to have to do a lot of planing by hand because I have never done it and don't yet have the planes to do it with or trying to find someone to do it for me by machine. I see by various posts here and elsewhere that there are pitched battles on the woodworking forums over how folks sharpen their tools? Silly.